Round it up and the 97.75 Shaun White posted to secure his third Olympic gold in the men’s halfpipe turned into 100. White’s winning run gave him three career Olympic golds and also served as the 100th gold captured by the United States in the Winter Games. 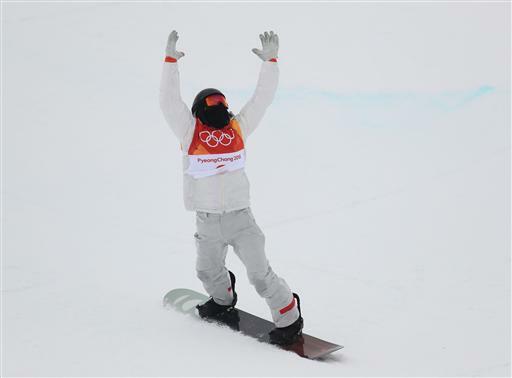 American snowboarders have racked up four golds at Phoenix Snow Park and stood atop the podium 14 times in all since the discipline made its Olympic debut at Nagano 20 years ago. #TeamUSA has made it to 100 Winter Olympic gold medals! Congratulations to @shaunwhite on making history! White laughed at the idea he was the one to get the U.S. into triple figures. He’s had some pretty good luck with the number 100 recently. He was awarded 100 - a perfect score - at an event in Colorado last month, one that set the stage for his epic sprint to history in South Korea. Of course, his family is doing its best to make sure it doesn’t go to his head.